IELTS General Training is Still the Required Module for the New FSW Program - Gateway to Canada | Canada Immigration Consultancy! It's confirmed. 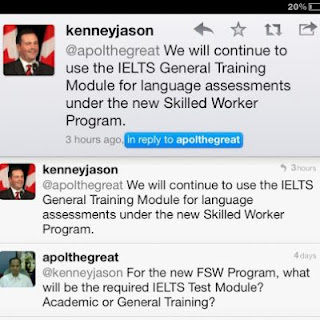 IELTS General Training Module is the required type of IELTS examination for the new Federal Skilled Worker (FSW) program. I asked the Immigration Minister about it via twitter and he replied. There's a rumor circulating that Academic module will be required. This reply from the Immigration Minister should put an end to it.